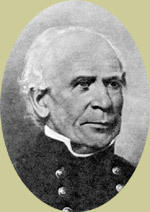 General Jesup. Florida Photographic Collection. Jesup, meanwhile, had to answer for the affair for the rest of his life. Even as late as 1858, in an interview with The Washington Daily Intelligencer, the Army Quartermaster was called to justify his actions. "There were some individuals who pretended to condemn the capture of Osceola and his warriors as dishonorable on the part of Genl. Jesup; -- as a base violation of a flag of truce. 'Tis true they had a white flag flying; but they [the Seminoles] were never told that it would afford them indemnity from capture on this occasion.... Even had they been enticed in under the immunity of the white flag, Gen. Jesup would have been perfectly justified in making prisoners of them, for he was dealing with the very individuals who had repeatedly and treacherously trifled with the flag of truce; had forfeited their plighted faith, and flagrantly deceived him, in forcibly carrying off hostages left by them in his hands; and when we recollect that this interview was sought by them with the worst of motives, public opinion ought not only to justify, but commend him for the transaction." The incident remains a fascinating muddle. At least two facts about Jesup, however, deserve to be noted alongside his reputation for treachery. First, he treated his prisoners with great humanity, a point noted by all observers, including the Indians and blacks themselves. Second, and of greater relevance to his character, after the war he became a friend to the Seminoles and Black Seminoles, taking their cause before higher powers -- but this is a later chapter in the story. Did Osceola surrender or was he captured?